Aaron Carpenter was the biggest winner on Wednesday night at the 13th annual Brantford Sports Council awards banquet, but he wasn’t the only one taking home hardware. 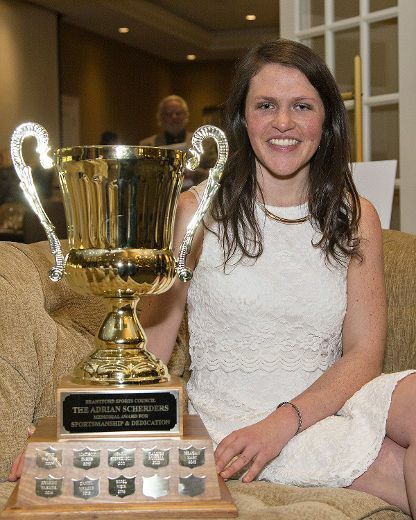 Carpenter, the winner of the Frank Tomlin Memorial Award as Brantford’s Sportsperson of the Year, joined many other accomplished athletes and officials in being honoured at the Brantford Golf and Country Club. There aren’t many sports Meghan Josling hasn’t tried during her eight years with Special Olympics. Josling has Noonan Syndrome, a rare genetic disorder that causes uncontrollable seizures that make it difficult to walk and sleep. At the age of 10, she had life changing surgery at Sick Kids Hospital that eliminated the seizures. Since joining Special Olympics, she has competed in swimming, floor hockey, soccer, basketball and power lifting. Most recently she has been concentrating on track and field. Josling is the first student with an intellectual disability to compete on a varsity team at Mohawk College. Such a well deserved award!